This thread is going to be about asking how to utilize and defeat certain squads, unique heroes, and event heroes. My first question is going to be how to best utilize Alfred Pennyworth? I really hope the community checks this out and gives feedback, I think this is a fun way to spark conversation. Last edited by Midgieboy3; January 21st, 2016 at 12:19 PM. 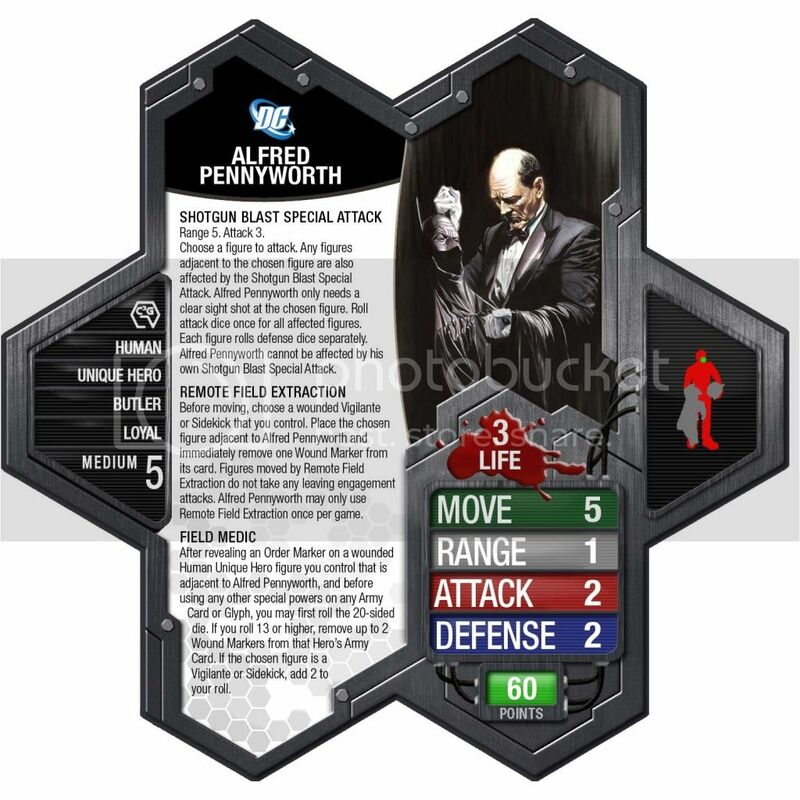 how to best utilize Alfred Pennyworth? Remote field extraction is a cool power, and useful, but that is not my focus. When I play Alfred, my goal is to never put an Order Marker on him, and use him for his healing. If he gets killed first, that's OK, because you spent 60 points so that somebody would attack Alfred instead of something else. That's him doing his job. The problem is how to keep him stuck next to a human who is flipping OMs. There's a few combos that come to mind. The easiest combo is probably Mad Thinker + Alfred, because Mad Thinker doesn't have to move ever. And if you want them to move, just add Red Tornado and let him whip them around a few times. Another easy option is John Stewart, who can carry Alfred and a couple friends to a good spot. Add in some good longer-range figures (archers and agents come to mind) and you can set up a nice little nest for Alfred to work from. Other options like Iron Man builds (with some Mark 2's to move Alfred) or Mandarin, or many others really, can help you get Alfred in position to do what you need. Awesome feedback, thanks so much. I normally use Al to keep batman alive. Last edited by Midgieboy3; July 8th, 2015 at 11:21 PM. Yeah, the easiest use with Alfred is in Vigilante builds to pull back and heal a wounded Vigilante or Sidekick; in those builds, he plays well with Robin (Damian), who's Bat Brat power can place him back next to Alfred. However, as dok pointed out, there are a lot of other builds you can run him in to get the most out of his healing ability. John Stewart in particular works nicely with him; a fun one for only 810 points is John Stewart, Alfred, Captain America (Hasbro), and Bane. Alfred can heal all three of his teammates, while Cap and Bane's boosts keep him alive and boost up John Stewart's offense. Cool thread by the way. Thanks, was was going to try to make it real legit and put a pic of the card and figure, maybe for the next one. I'm glad someone likes it. I would like to talk c3g all day because no one I know plays. Next is going to be some squads I think are cool. Next up is the old Boy Scout. What are some of the best army's to put Superman I in, also what are some of the best army's or figures to defeat Superman. Also, Flash can stay alive and keep using his SA. You definitely want to have good special attacks or a big normal attack going up against him. Man of Steel is his biggest benefit, IMO. I mostly like pairing him with figures that 1) stay out of his way (Heroic Duty is more of a weakness than a benefit most of the time and 2) cover for anything he's lack (Wonder Woman is great for coming in and lassoing any figures that give him fits). Oracle is probably one I'd start out with, as she can sit all the way in the back of the start zone and help him win initiative, add an auto skull a round to his attack, and prevent any Order Marker loss if he dies in the middle of a round. Then load him up with Order Markers and send him off to assassinate all the key figures in the enemy army. If he gets stuck (figuratively, or literally if Blob's around), bring in your back up (like Wonder Woman, or someone fast with a good special attack like Flash). 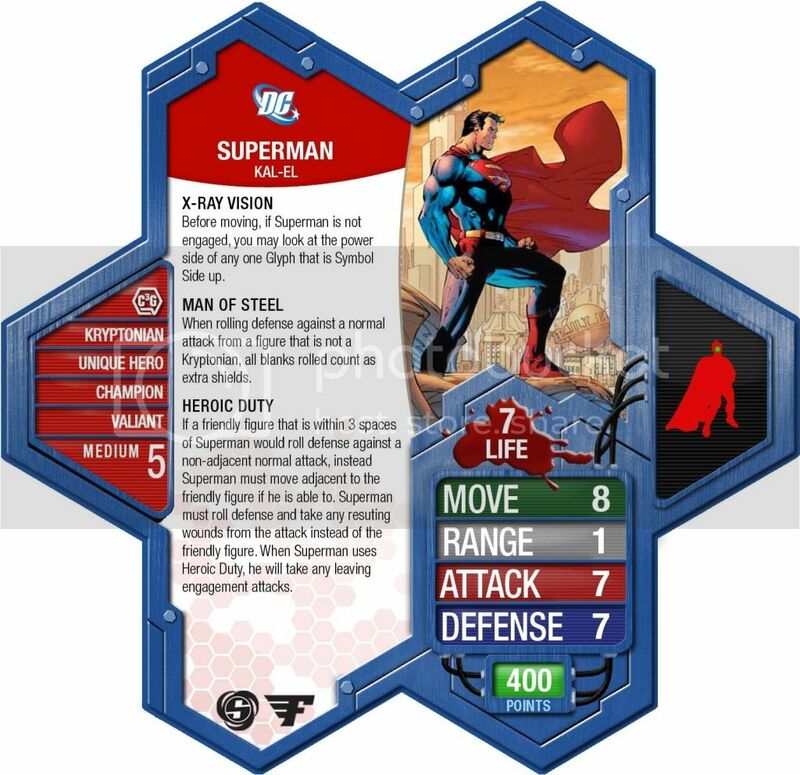 Someone with multiple attacks (again, like Flash) is a nice complement to Superman as well, as they can handle crowd control while Superman takes on the mid-level heroes and heavy hitters. Sinestro's Force of Fear Special Attack is always a good idea when going up against Supes. Yeah, he definitely hates that one. Nice solid special attack that subtracts defense dice to boot. Good call. Averaging 20 post per year!!! Great comment...you should speak more. To anyone new these are great tips from the top dogs.